Telling a story in wargame format – the design goal of the Panzer Grenadier series – means telling the full story, both the famous battles and those not so famous. While we won’t be returning to Italian East Africa, post-independence India or South America very often, we also want to explore the full story of the better-known campaigns as well. 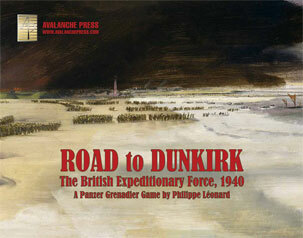 Philippe Léonard has made sure that Road to Dunkirk covers not only the famous battles of the British Expeditionary Force, but those less remembered as well. Let’s have a look at the first half of the game’s sixth and final chapter. You can see Chapter One here, Chapter Two here, Chapter Three here, Chapter Four here, the first half of Chapter Five here and second first half of Chapter Five here. Barely mentioned in popular histories of the 1940 campaign, a “Second BEF” fought in France after the Dynamo evacuation. The 51st and 52nd Infantry Divisions and 1st Armoured Divisions as well as the provisional Beauman Division (and the 1st Canadian Division, portions of which landed in France and evacuated again before ‘seeing any significant action) and nearly 100,000 logistical troops fought on after their fellow countrymen had been pulled from the beaches and mole at Dunkirk. Their continued involvement had more to do with the political hopes of the British government that the French would fight on in some capacity, even from Africa, than any expectation that the Germans could be stymied in France. The British divisions joined the French 10th Army arrayed along the Somme. We’ve seen some of their battles as they fought in vain to open a corridor to the trapped armies in Flanders. Here we see them as the full weight of the German forces turns south to finish the job. It wasn’t really a fair fight. The 51st Division had, at one point, a frontage of 16 miles with nearly all of its senior commanders operating in a state of shock. We should recall that in just three weeks something close to 40 percent of the Allies’ combat capability had been vaporized. This fact weighed heavily on all Allied soldiers’ minds. The fact that they fought as hard as they did is a testament to the power of hope in a dark time. The British commander, General Sir Alan Brooke, quickly decided that he lacked the troops to hold the planned redoubt in Brittany. He fought for a second withdrawal from the continent, dubbed Operation Ariel. Not everyone could reach the evacuation ports; a substantial part of the 51st Division was trapped near St. Valery with the subsequent surrender of 10,000 men along with their division commander, Victor Fortune. The bulk of the forces successfully withdrew with nearly 200,000 men taken from Breton and Norman ports, including nearly 50,000 French. At times the attacking Germans fell prey to the expectation that the war was essentially over and that dying at this point would be a tragedy. Towards the end of the campaign both sides seemed less inclined to wage pitched battles than during the fighting in Flanders. It was widely believed that, with the impending fall of France, England would sue for peace and the war would end. That misperception would take five more years to correct. After the failure of De Gaulle’s 4e DCR’s assault on the Abbeville bridgehead, a lull fell over the battlefield. However the French were already preparing their next move in combination with the 51st Highland Division and what was left of the 1st Armoured Division. Armored probes again went to the Somme to gain access to the river and secure the flanks. West of Abbeville, the northern group of the 5e Division Légère de Cavalerie was to seize Saigneville and the foot bridge across the Somme nearby with the support of 15 British tanks. The attack met only light resistance at first, but when 105mm shells crashed around the tanks the British quickly left the battlefield. Despite intense mortar fire, the French eventually reached the village at 1815 and Lieutenant Lancien led one squad across the foot bridge leading to Petit-Port. Lancien was soon killed and the Germans took the initiative, crossing the bridge again and taking part of Saigneville. In the evening French reinforcements regained both the bridge and village, but the slightest gain on this battlefield required tough fighting. The British and French are on the attack; Britain’s lone armored division retains many of its tanks, but the crews have been shocked by the reality of modern armored combat and are reluctant to press the attack. That’s going to shift the burden to the French, who aren’t all that enthusiastic, either. Meanwhile the Germans are just hoping the enemy will run away before they overrun the lone German anti-tank gun. While newly-arrived French tanks attacked along the slopes of Mont Caubert, the 153rd Brigade, on the extreme left, would attack south-eastward and capture Grand Bois on the spur overlooking Cambron. The main objective was the destruction of two 88mm guns emplaced south of Cambron and aimed at the Allied armor attacking Mont Caubert. Brigadier George Burney entrusted the operation to the 1st Gordons. The 1st Gordons proceeded to clear a stubborn enemy from well-concealed machine-gun posts amid the trees and thick undergrowth of Grand Bois. Before noon, the Gordons reached the high ground on the south-eastern edge of the woods and, although they had taken their first objective, they remained ready to go further. They had killed more than 50 Germans and had taken many prisoners at the cost of 40 killed and wounded. The battalion waited for orders to resume the advance, but no such orders came. The failure of the main attack against Abbeville bridgehead had left their right flank exposed so they had to withdraw, giving up all the ground they had won. A small, and pretty fierce, infantry fight as the Scots are out to eliminate a very dangerous German 88mm battery. They have other objectives, but it’s going to be hard to meet them and win the game with the deadly cannon still operating. The day dawned to the accompaniment of a thunderous barrage of shell and mortar fire falling on the Scottish 154th Brigade. Its two scattered battalions were in no position to conduct a coordinated fight. The resulting battle developed into a series of isolated actions, with each company holding its own stronghold and fighting gallantly to the last. The British arrayed themselves in company-sized packets along the front and in the towns to the immediate rear. While this approach had worked well in the Flanders countryside with its waterlogged terrain, here south of the Somme the going was easier and the Germans isolated and crushed the British strongpoints one by one. Bren carriers were the only mobile reserves, and proved unable to stop the German advance. There are a lot of Germans, backed by a lot of artillery; at least they don’t have tanks or Stukas. There are also a lot of Brits, but they have to cover a very wide front and the Germans are going to have an excellent chance of establishing pretty overwhelming local superiority. They do have a high bar for victory, with the forces to meet it. On the Allied right flank in front of Abbeville, the 51st Highland Division deployed the 1st Battalion of Lothians & Border Horse along the Somme River. On the high ground next to Mareuil-Caubert village, A Squadron had pressed a broken-down French tank into service as a strongpoint, using its cannon and machine gun. At 0415, violent firing erupted from the right, against Bray village. C Squadron at Bray fought off the German attack with help from A Squadron’s carrier troop. Then it was A Squadron’s turn to come under attack when German infantry made a sudden appearance in their sector. German artillery fire became more accurate as their gunners registered the Lothians’ positions and some outposts were evacuated. A Squadron held its position until noon when the shells for the tank ran out. Once again, the Brits are defending a river line. This time the Germans aren’t very enthusiastic, and their artillery shows up late. It may not be enough to keep them on their side. Feeling the full weight of Case Red, the German attack to subdue what was left of France, the 7th Argyll and Sutherland Highlanders battalion headquarters fought its own private battle in Franleu. Already bypassed by the German columns and supported by some infantry, the HQ managed to hold the position in the morning. After this, the situation became worse: all communications were cut, and all hope of controlling the battle from battalion headquarters was lost. In the early afternoon plans were made for a counter-attack to be delivered by a battalion of the Black Watch, assisted by tanks. The 4th Black Watch went forward for the attack, but immediately found the railway line firmly held by the Germans. One company supported by French tanks tried but failed to gain control of the village of Saucourt. When it became obvious that such a small force could not expect any success, the attack was called off. In Franleu the situation at battalion headquarters became hopeless. By 1600 only two officers remained unwounded, ammunition was practically exhausted and all the reserve ammunition was blown up. Attack and counter-attack! It’s a tense infantry fight, and while the Germans have the numbers, the British have the Black Watch. They also have a handful of French light tanks, which should help a great deal since the Germans have no anti-tank guns. And that’s the first half of Chapter Six.